What are the secret/hidden Netflix codes? You may have heard about "secret Netflix codes" that Netflix uses, or how you can unlock hidden movies and TV shows. While this may sound like a hackers trick, it's actually not that complicated, and it's not really unlocking anything! So these titles are essentially hidden from you, but they aren't being kept from you. You can access them by searching for them directly OR by browsing the genres and subgenres that Netflix uses to classify movies. What is a Netflix Genre? If you know the numeric code that goes with each Netflix genre/subgenre, you can get a list of all the movies on Netflix within that category. For example, the code for Spanish-Language Biographical Documentaries is 52855, and the code for Dramas directed by Sidney Lumet is 4571. Simply change the code at the end for whichever secret Netflix code you want to view, and you'll see what's available in your country under that category! Want to actually unlock movies that even secret codes can't give you? Netflix has different movies that they make available in each country. Some countries have many more titles than other countries, maybe more than yours, and certainly different ones! We've got instructions that will allow you to unlock these movies and TV shows using a VPN, allowing you to switch between countries and watch all these extra titles! 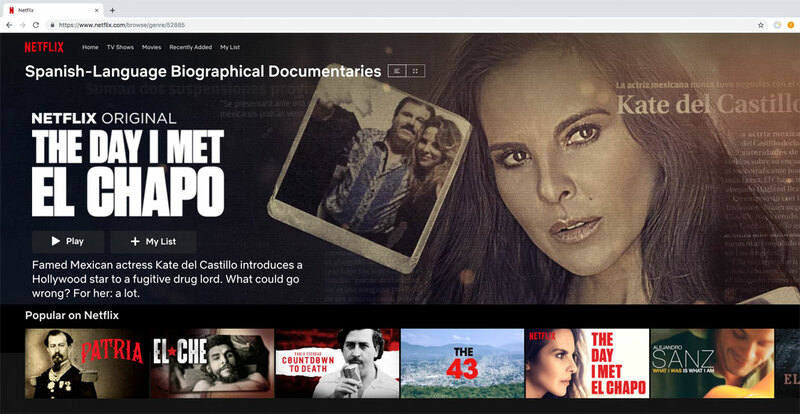 Check out our "Get American Netflix" page to learn how to watch American Netflix plus Netflix in over 50 other countries. And make sure you use the links on that page to sign-up, since we have an exclusive offer that will save you money! We've put in the effort of finding as many of these "secret codes" as we could so we could list them here. We've currently found 28279 of them! Sometimes a code will be slightly different in different countries, or may not even exist. If you find a code that we don't have please contact us so we can update our list! We've got three different ways that you can view the entire list. With so many hyper-specific categories, it's hard to know how to best display them! 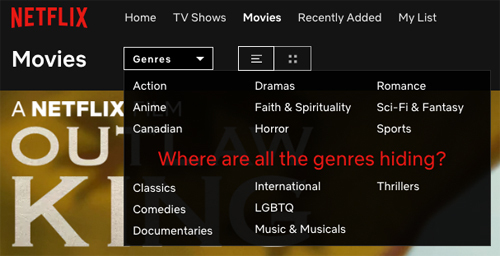 Each genre is a link to the Netflix genre page that will open in a new window, but you will need to be logged into Netflix to view them all. HINT: Press Control-F or Command-F on your keyboard to search the list. Wondering why "Action" shows up twice? We don't know why, but Netflix has two different codes, and shows different movies for each! 43360 - Action & Adventure starring Cuba Gooding Jr.
43822 - Action & Adventure starring Louis Gossett Jr.
60905 - Action Thrillers starring Cuba Gooding Jr.
75058 - Suspenseful Action Thrillers starring Cuba Gooding Jr.
31 - Children & Family Movies directed by Arthur Rankin Jr.